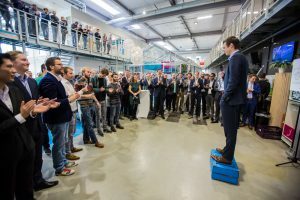 Delft, 7 December 2016 – ParaPy, a start-up in software engineering and automation support announced that it will collaborate with Fokker, a business unit of GKN Aerospace. The aim of the collaboration is to reduce the duration of the development phase of complex aircraft components through extensive automation and application of the latest simulation software. The partnership was announced during the visit of Dutch Prime Minister Rutte to start-up incubator YES!Delft. The first project will consist of the joint design and development of a rudder; the objective is to reduce the design time of a year to several weeks. 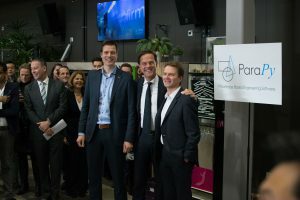 ParaPy and Fokker will jointly develop several applications with the ParaPy platform and state-of-the-art simulation software. ParaPy B.V. delivers software products and related services for automation of simulation-driven engineering processes. The unique ParaPy software platform enables engineering companies and academia to design products faster and optimize them.